RCAN1-deficient mice display increased mortality, but decreased bacterial burden following P. aeruginosa lung infection. RCAN1 wild-type (+/+) and knockout (−/−) mice were infected intranasally with 1 LD50 (2.25 × 107 CFU) of P. aeruginosa strain PAK. Mice were then left untreated, or were treated with 200 mg/kg ceftazidime (Ceft) s.c. every 8 h. Animal survival was monitored daily (A) (n = 10, *p < 0.05, ***p < 0.005). Wild-type and RCAN1-deficient mice were also infected intranasally with 107 (4-h) or 109 (24-h) CFU P. aeruginosa strain 8821, or an equivalent volume of saline (NT). Lungs and BALF were collected 4 or 24 hpi. Serial dilution of homogenized lung tissue (B), BALF (C), spleens (D), and blood (E) was streaked on LB agar plates and incubated 24 h at 37°C. The resultant colonies were counted to determine bacterial load (n = 8–10 ± SEM, *p < 0.05). Samples were then lysed, and MPO activity was assayed in the lungs (F) and BALF (G) (n = 6–11 ± SEM, *p < 0.05). RCAN1-deficient mice have elevated serum cytokine levels following P. aeruginosa lung infection. RCAN1 wild-type (+/+) and knockout (−/−) mice were infected intranasally with 1 LD50 (2.25 × 107 CFU) of P. aeruginosa strain PAK. Mice were then left untreated, or were treated with 200 mg/kg ceftazidime (Ceft) s.c. every 8 h. Serum was monitored by ELISA at various points over the first 12 hpi for IL-16 (A), MIP-2 (B), and IL-1β (C) (n = 8–10 ± SEM, *p < 0.05, ***p < 0.001). RCAN1-deficient macrophages display enhanced production of proinflammatory cytokines in response to P. aeruginosa infection. Wild-type (+/+) and RCAN1-deficient (−/−) bone marrow–derived macrophages were left untreated (NT) or exposed to P. aeruginosa strain PAK at a MOI of 1:1. 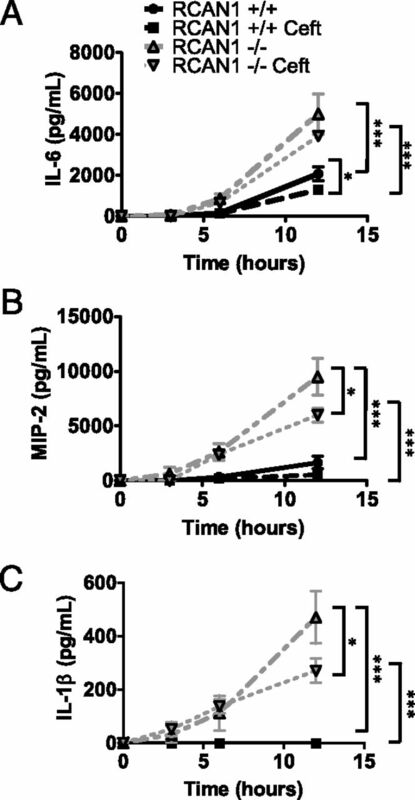 Supernatants were collected at various time points and analyzed for the proinflammatory cytokines MIP-2 (A), TNF (B), IL-1β (C), and IL-6 (D) (n = 3 ± SEM, *p < 0.05, *p < 0.01, ***p < 0.001). Lysates were prepared and subjected to Western blot for phospho and total-IκBα as well as actin-loading control (E). Blots are representative of three separate experiments, which were quantified by scanning densitometry (F) (n = 3 ± SEM, *p < 0.05, ***p < 0.001). 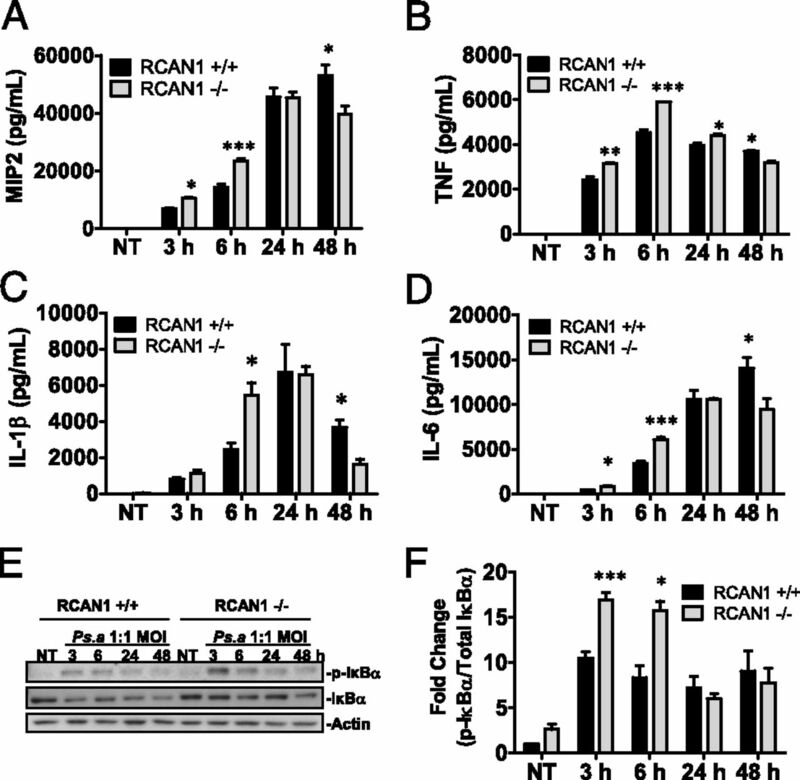 RCAN1-deficient mice display enhanced inflammatory transcription factor activation in vivo following P. aeruginosa infection. RCAN1 wild-type (+/+) and knockout (−/−) mice were infected intranasally with 107 (4-h) or 109 (24-h) CFU P. aeruginosa strain 8821, or an equivalent volume of saline. 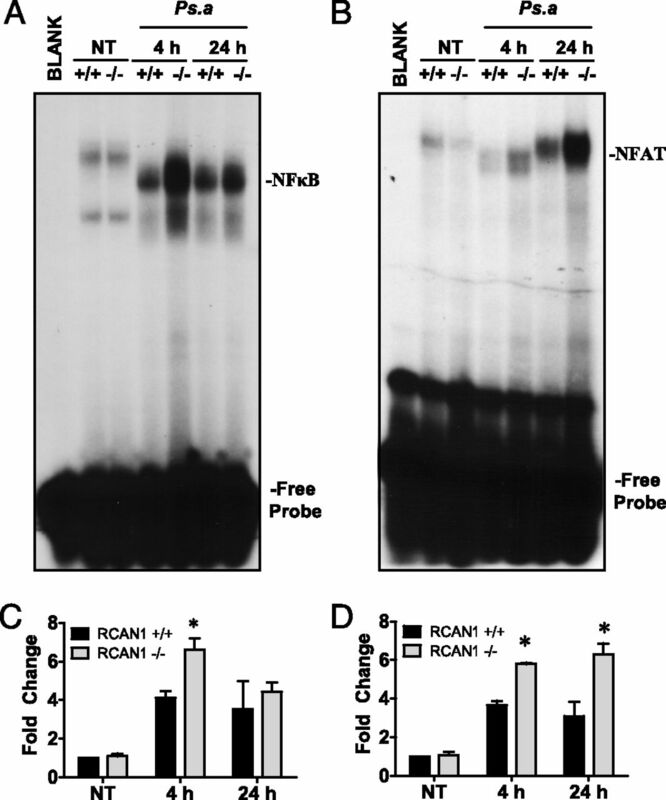 Nuclear proteins were extracted from lung tissues obtained from individual mice and subjected to EMSA by incubation with 32P-labeled NF-κB (A) or NFAT (B) DNA probes. Data are representative of three individual experiments. Scanning densitometry was performed (C, D), and data are expressed as fold change versus wild-type untreated lungs (n = 3 ± SEM, *p < 0.05). The ERK/STAT3 pathway is differentially regulated by RCAN1 following P. aeruginosa infection in vitro and in vivo. Bone marrow–derived macrophages from wild-type (+/+) and RCAN1-deficient (−/−) mice were treated with P. aeruginosa strain 8821 at a MOI of 1:10 for various time points. Lysates or nuclear extracts were prepared and subjected to Western blot (A) or EMSA analysis, respectively (E). RCAN1 wild-type (+/+) and knockout (−/−) mice were infected intranasally with 107 (4-h) or 109 (24-h) CFU P. aeruginosa strain 8821, or an equivalent volume of saline. Nuclear proteins were extracted from lung tissues obtained from individual mice and were subjected to EMSA by incubation with 32P-labeled STAT3 DNA probe (F). Data are representative of three individual experiments. Scanning densitometry was performed (B–D, G, H), and data are expressed as fold change versus wild-type untreated lungs or lysates (n = 3 ± SEM, *p < 0.05, **p < 0.01, ***p < 0.001). 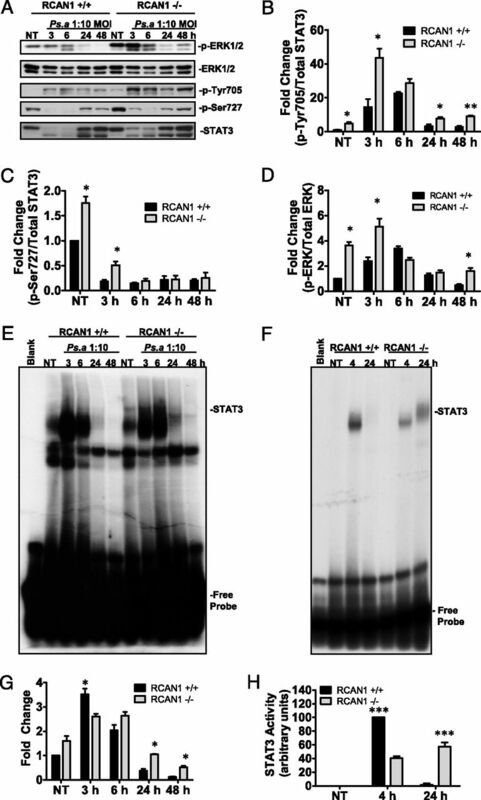 Figure S1: RCAN1 is induced in response to P. aeruginosa infection. Figure S3: RCAN1-deficient macrophages display enhanced cytokine production and IκBα phosphorylation following P. aeruginosa infection. Figure S4: RCAN1-deficient mice display enhanced inflammatory transcription factor activation in vivo following P. aeruginosa infection.